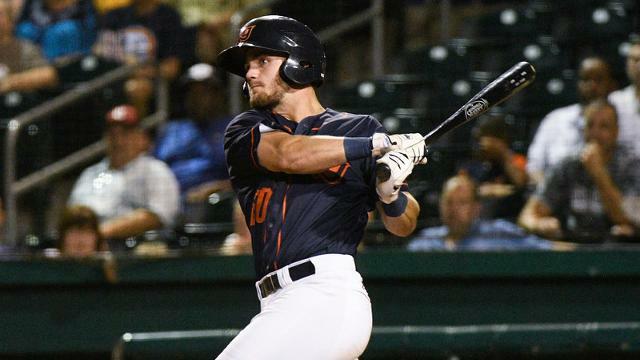 COMSTOCK PARK, MI - The Bowling Green Hot Rods raced out to a 3-0 lead against the West Michigan Whitecaps, and held on for a 6-5 win on Saturday night. 1B Jim Haley had a big night at the plate, and LHP Resly Linares earned the win. The Hot Rods struck first in the third inning. With one out, LF Moises Gomez and SS Taylor Walls clubbed back-to-back singles. 1B Jim Haley followed with a triple to the wall in left-center, and it was 2-0 Bowling Green. The lead went to 3-0 when C Ronaldo Hernandez brought Haley in on a sac fly that was just deep enough to center field. Bowling Green added to their lead in the sixth when DH Trey Hair scored. 3B Zach Rutherford hit a ball to left field that was misplayed, and it allowed Hair to come around to score, making it 4-0 visitors. West Michigan got on the board with a two-run home run to left field in the bottom of the sixth to close the gap to 4-2. The Hot Rods responded with a two-out rally in the top of the seventh, taking advantage of another West Michigan error. Haley worked a walk, and that was followed by a single from Hernandez. The ball was misplayed by Whitecaps RF Brady Policelli , and it allowed Haley to score. Hernandez then came around to score on a Hair single, making it 6-2. The Whitecaps responded with two more runs in the seventh, getting it back to a two-run game at 6-4. RHP Matt Seelinger came on in the eighth inning and retired the side in order. In the ninth, the Whitecaps worked a rally. They sent seven batters to the plate, and scored a run to make it 6-5. With two outs, the Hot Rods issued an intentional walk to load the bases and create a force out situation. However, Seelinger induced a first pitch pop up in foul territory and Haley caught it for the final out. LHP Resly Linares earned the win. He threw five and two-thirds innings, allowing four hits and two runs (both earned), walking two and striking out five. Seelinger picked up the save. The series shifts to Bowling Green starting tomorrow night at 6:35pm Central. RHP Paul Campbell (4-1, 2.70) will get the call for the Hot Rods, while RHP Elvin Rodriguez (8-7, 3.34) will go for the Whitecaps.